Eliad Inbar (above), Founder of e-Commerce start-up, Tangiblee, introduces his technology at the 2015 America-Israel Chamber of Commerce Chicago Innovation Showcase & Awards Celebration. 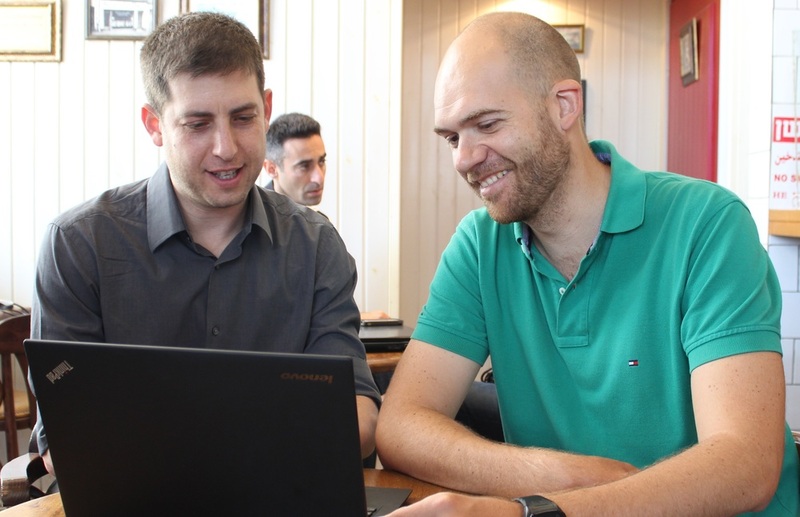 Pictured above are Tangiblee's Founders Eliad Inbar (left) and Yevgeniy Kuznetsov (right). Eliad Inbar is the Founder of Israeli e-commerce start-up, Tangiblee, which earlier in 2015, established their North American headquarters here in Chicago. We at the America-Israel Chamber of Commerce Chicago are dedicated to supporting companies like Tangiblee in their efforts to attract customers, capital, and new hires in order to succeed here in the U.S. Showing value to Eliad and other inbound Israeli entrepreneurs like him will ultimately help position Chicago as a top destination for emerging technology businesses from Israel seeking a viable expansion point into North America. Should you or any of your colleagues be able to facilitate introductions to venture capital sources (VC firms, Angels, seed funds, etc.) or make connections to furniture, home decor, jewelry, and/or handbag retailers, please CLICK HERE to start the conversation and let us know how you can assist. Tangiblee is a fast-growing, well-funded e-commerce start-up initially located at 1871 (and TechStars 2014 alum), that has revolutionized the way consumers interact with products online. The company’s unique solution dramatically improves web site performance for retailers, increasing conversion rates, boosting revenues and reducing churn, while creating a more helpful, engaging user experience. Their product offers a way for online retailers to give context to their product, by showing its relative size and lets customers compare the product with other known items. From their new offices in Chicago and Israel, Tangiblee is attracting a global network of customers, including a few large American clients, as well as some in the UK, India, Australia and South America. Tangiblee’s global client base is due not just to the international nature of the co-founders, but the global nature of the problem. The shopping experience Tangiblee provides is tangible. And it gives customers a way to gauge their expectations, cutting down disappointment and subsequent returns.